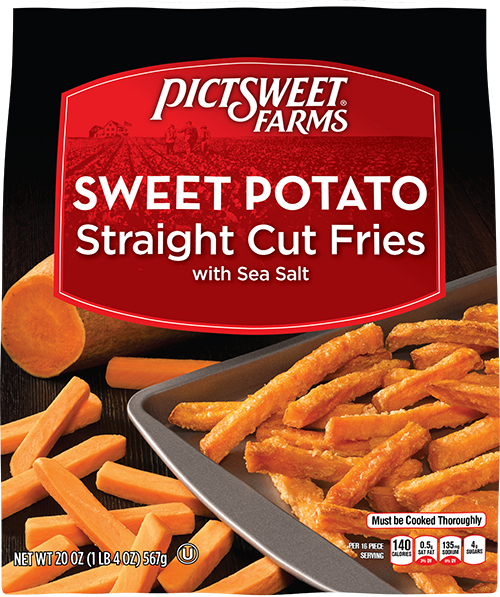 Experience the sweet taste and crunchy texture of Pictsweet Farms Sweet Potato Fries. We use only the highest quality sweet potatoes and season them with just a touch of sea salt. Also available in Crinkle and Waffle cuts – and try our Fusion Fries, a delicious blend of sweet and white potatoes. Sweet Potatoes, Soybean Oil, Unbleached Wheat Flour, Unmodified Wheat Starch, Sea Salt, Extractive of Paprika (Color), Guar Gum. CONTAINS SOY AND WHEAT INGREDIENTS.